The first flavors I pick up on the palate is a light sweet followed by a light sauce. The heat picks up right away and builds fast. The chewing brings on a bit more sweet with a noticeable soy sauce. There's just a faint bit of chile pepper flavor, and a touch of garlic. For being called, "Wicked Hot" it certainly is "hot" (level 5 out of 5) on our heat scale. Considering the package says, "made with ghost pepper and habanero", however, die hard chile pepper fanatics won't get the seething burn that these two chiles are famous for. The Scoville scale is more along the lines of a fresh jalapeno. I'm still getting a good endorphin rush, however, and a fair amount of sweat beading on my scalp. Otherwise, the primary taste profile is that of a lightly sweet, soy sauce-focused marinade, with garlic and black pepper seasonings. The ghost pepper and habanero offers only a light bit of flavor, adding a swash of color to the marinade. The meat consistency looks and chews excellent. It's dry, but still chews easily and feels quite flexible. Once it softens up it takes on the texture and feel of real steak, cooked well done. I don't see any bits of fat on these pieces, and nothing excessively stringy. 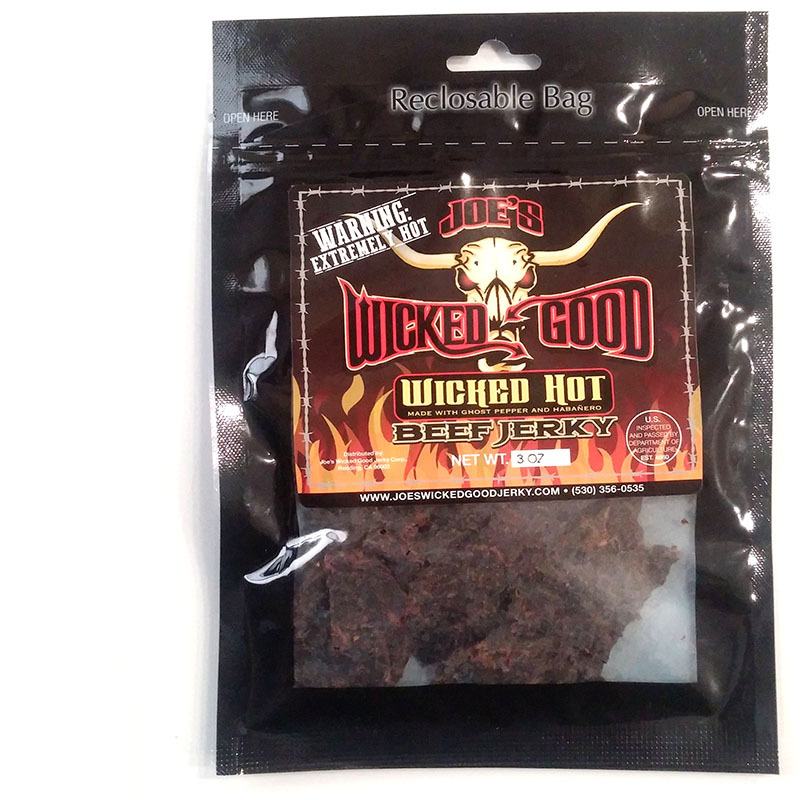 This "Wicked Hot" from Joe's Wicked Good Jerky delivers a good deal of heat, enough to hold up the name, "Wicked Hot", but I'm not sure is worthy of the warning, "Extemely Hot". 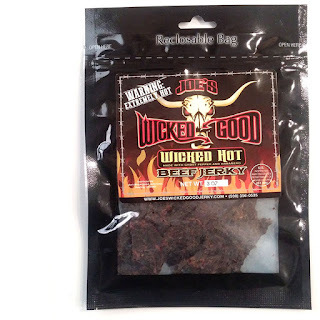 Considering this is a jerky that only fiery food fanatics would dare try, it's level of burn is much lower than the expectation of a ghost pepper or habanero. Moreover, it doesn't quite offer much chile pepper flavor, which for me is a big part of being a chile pepper lover. 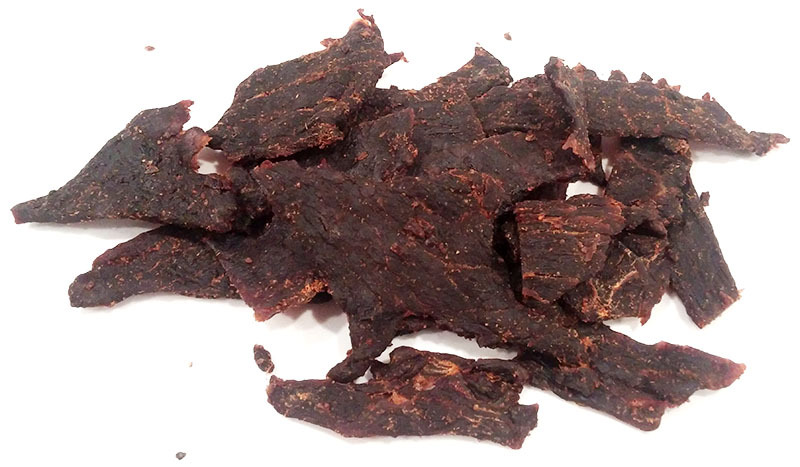 Nonetheless, on its own merits, it's still a very good jerky in terms of its sweet, saucy, seasoned marinade, and excellent meat consistency. 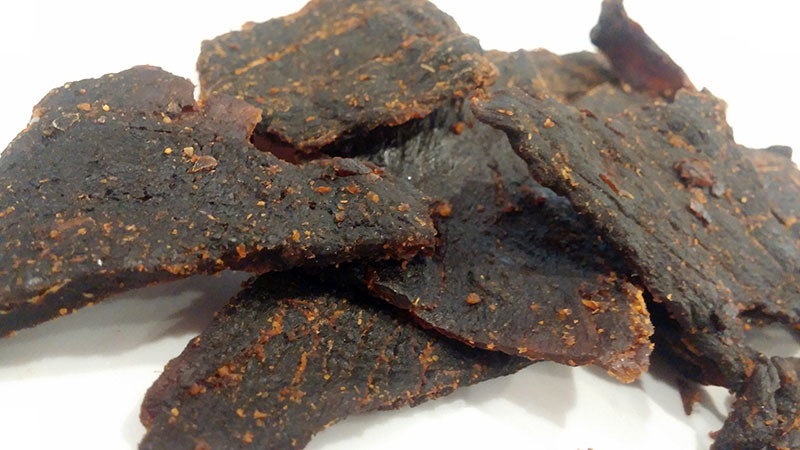 The punch of chile pepper heat, and the endorphin rush, only makes this jerky better for me. If this is the same joe that had a turkey jeky plant in the dinuba Ca. Area, it is the best turkey jerky you will ever eat.